Walter T. Wolf is the President of Walter T. Wolf, LLC, a civil litigation and business law firm with a refined focus on construction and engineering law, based in Audubon, New Jersey. Mr. Wolf’s background in defensive construction liability, and financial, commercial, business, real estate, surety, and construction litigation allows him to expertly run the company’s operations. He manages and supervises attorneys, paralegals, law clerks and staff, develops strategies to resolve disputes, and devises support systems for related litigation analyzing. 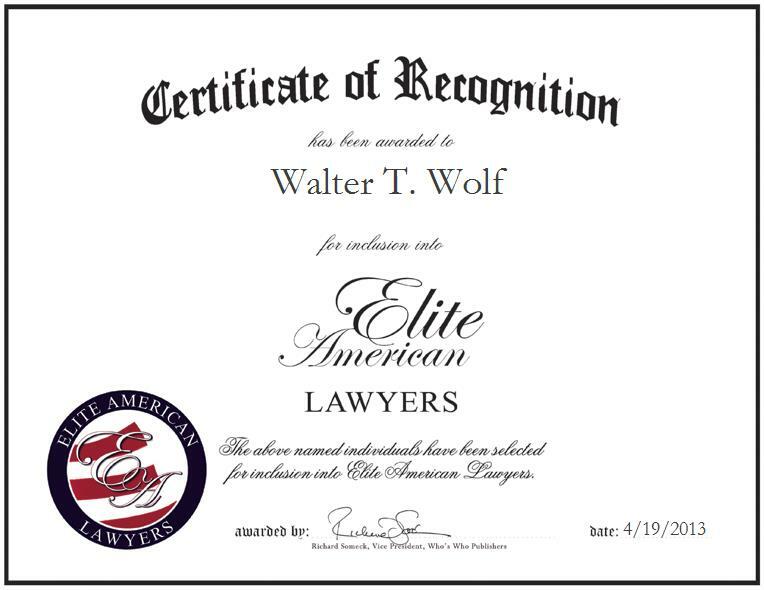 Mr. Wolf also plans and litigates complex factual and legal issues and advises clients in these matters. Mr. Wolf has also won national sailing championships as a teenager for several years and built and refinished boats through his marine company, Quality Marine Products.